Happy birthday Ellen Levine (Henry’s Freedom Box), Margot Apple (Sheep in a Jeep), A. LaFaye (Worth), Harry Bliss (Louise, The Adventures of a Chicken), Joan Lexau (Crocodile and Hen: a Bakongo Folktale), and Denise Brunkus (Junie B. Jones series). It’s the birth date of chess master Bobby Fischer (1943–2008). Read Chess: From First Move to Checkmate by Daniel King. In 1796, French Emperor Napoleon Bonaparte marries Josephine. Read Napoleon: The Story of the Little Corporal by Robert Burleigh. In 1841 the United States Supreme Court rules the captive Africans who seized control of the ship carrying them had been taken into slavery illegally. Read Amistad: The Story of a Slave Ship by Patricia McKissak, illustrated by Sanna Stanley. On March 5th we celebrated a relatively new holiday, World Read Aloud Day. I’d like to continue this celebration by talking about my favorite recent read-aloud, written by Germany’s bestselling author for children, Cornelia Funke. Cornelia was brought to the attention of publisher Barry Cunningham by a devoted fan. The girl wrote to Cunningham, who had discovered J. K. Rowling, and told him that although he published the Harry Potter books, he did not publish the best writer in the world—Cornelia Funke. This letter piqued his interest, and after he read a translation of a couple of chapters of The Thief Lord, Cunningham was convinced that Cornelia deserved a chance to beguile English-speaking children. When The Thief Lord appeared, it became a New York Times bestseller. 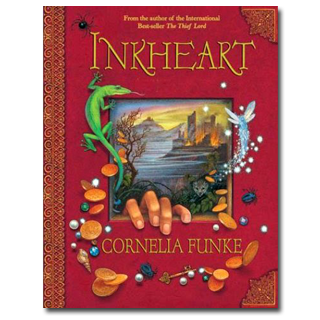 Funke both wrote and illustrated her next book to appear in English, Inkheart, our book of the day. By working with Anthea Bell on the translation, she was able to get the right sound and timbre to her words. I’ve always been glad that so much attention was paid to the translation, because it is one of the reasons why Inkheart reads aloud so well. In this book-lover’s story, twelve-year-old Meggie lives with her father Mo. Her mother has been gone for nine years. Father and daughter both adore books. He repairs them; together they read voraciously and share their love of the written stories. One night a mysterious stranger appears, Dustfinger, and in a rush Mo takes Meggie to the home of her mother’s aunt Eleanor, another book nut who collects rare editions. They are fleeing from a pursuer, the evil Capricorn and his henchmen; eventually they all end up as prisoners in his medieval Italian village. Only then does Meggie begin to learn her true history. Mo can read aloud so brilliantly that he actually coaxes characters from books into the real world. Unfortunately, a real person from this world then goes into the book. Hence Meggie’s mother, Theresa, vanished into a book called Inkheart. Capricorn, Basta, Dustfinger, and other villains emerged from the tale to cause terror in this world. Meggie also discovers that she has inherited this reading gift from her father, when she brings Tinkerbell out of Peter Pan one day. After Mo brings the author of Inkheart into the adventure, Meggie attempts to reorder the world in the right way. Although probably every lover of literature harbors a fantasy about actually meeting a character that they love in fiction, most of us would not like to encounter some of its villains face-to-face. Funke sets scenes and creates atmosphere brilliantly. All the chapters are just the right length for reading aloud; they contain a lot of action, cliff-hanging endings, and beautiful language. The book has been perfect for use with nine- through fourteen-year-olds, in class or at home. Reading this book slowly, savoring the scenes and the details of the plot, actually makes it more enjoyable than reading it independently. So if you are hunting for a great book to read aloud, pick up Inkheart. For those who become enthralled, it begins a trilogy continued in Inkspell and Inkdeath. Meggie sat on the bench behind the house. Dustfinger’s burnt-out torches were still stuck in the ground beside it. She didn’t usually hesitate so long before opening a book but she was afraid of what was waiting for her inside this one. That was a brand-new feeling. She had never before been afraid of what a book would tell her. Far from it. Usually, she was so eager to let it lead her into an undiscovered world, one she had never been to before, that she often started to read at the most unsuitable moments. Both she and Mo often read at breakfast and, as a result, he had more than once taken her to school late. And she used to read under the desk at school, too, and late at night in bed until Mo pulled back the covers and threatened to take all the books out of her room so that she’d get enough sleep. Originally posted March 9, 2011. Updated for . Anita- I’m so glad you write about Inkheart today, one of my favorite books, because I had not thought about it as a read-aloud…and that’s a perfect idea! Thank you for writing this column…it enriches my day. I love that you chose to include Inkheart! It will always be one of all time favorite novels! What I truly love about this book is how imaginative it is. Nothing gets me more excited than books that invoke the imagination and remind me why I love reading so much. I just discovered a new valuable book for my home library … once again thanks to you! I was really interested after reading this book to see in a Cornelia Funke interview that she had already cast the book characters as movie actors. She saw Mo as being Brendan Frasier (who later played the role AND did the book on tape for the English version of “Dragon Rider”) and Paul Bettany as Dustfinger … I just thought that her visions of real live people to help mold her characters really came through in the writing. And then, when the movie came out, for all the changes they made, those two characters were my favorites, just as they were in the book …. I always check this blog first thing when I get into work in the morning (I’m a librarian at a charter school), and I’m so glad I did yesterday morning – I had no idea it was World Read Aloud Day! I quickly pulled together a lunchtime read-aloud in my library. It was packed, and although I didn’t read from Inkheart (I chose the last chapter of Tales of a Fourth Grade Nothing instead), it was a huge success. Thanks for alerting me, Anita! Erica: A great read aloud choice. Thanks for letting me know. There were a lot of great activities yesterday. It is wonderful when an event like World Read Aloud Day brings the children’s book community together. Every time I begin to read this book, something happens–school, a project, etc–and I have to put it down. This serves as a reminder: I must read this book. It is officially on my summer list. What I love most is her lovely use of description and her terrific premise. LIke you said, Anita, who wouldn’t want to read their characters to life? I absolutely adore this series! Mo and Maggie’s relationship always struck a personal chord with me because it reminds me of the kind of relationship I had with my own father when I was Maggie’s age. The movie is great too (I’m a huge Paul Bettany fan and he, in my opinion, played a fine Dustfinger), but I enjoy the books more. Of course, who can possibly forget about Elinor? At first I disliked her, but then I ended up loving her. Tough as nails, isn’t she? Anita, I had no idea that Funke did the translation as well! How fascinating. No wonder why it is so fun to read aloud. I recommend the Inkheart audiobooks; in fact, though my daughter and I have heard these books over and over again, we have never read them. The first one is especially wonderful, being read by the late Lynn Redgrave. The second one is read by Brendan Frasier. Thanks for recommending the audio books of this series. A great way to get into the books. I have not picked up this book….yet. I always look at it when I’m at the library, but have never decided to pick it up. This was just the shove I needed to decide to go get it! (But right now I’m reading two books, and have three others checked out, so I’ll have to remember to pick it up in a week or two.) Thanks Anita!! As a lover of books, a child who was allowed to go to the local book store and buy a book anytime and charge it to my father’s account and whose favorite gift was always a new book, I adored Inkheart when it was first published. Since I was working in a children’s bookstore, I read the galley before it was available in the store and have since recommended it to children and adults alike. It is definitely in my top ten of all time favorite books! Kelly, do remember to pick it up the next time you go to the library! I love love loved Inkheart as a child – probably because this was my absolute fantasy as a bookworm! I also love “The Thief Lord,” also by Cornelia Funke, which inspired my life-long love of Venice! Inkheart would be worth a reread – I remember so little of it, just the feeling it gave me, and the fact that I absolutely loved it. As a kid, this book was what I had always dreamed of put to the page. I even attempted to read this book aloud to my younger sister in hopes that characters like Dustfinger would suddenly appear. Although it never worked, I still love to reread this story. This book was brought to my attention by one of my 7th graders who was such an advanced literary critic that I used to let her teach my class and lead book group discussions. It is a beautiful story that creates such an interesting meta-fictive environment. I desperately wanted this to come true in my life. As the series goes on, the power of words and the love of books is developed even further, and the frenetic author Fenoglio becomes a beloved character, although not above criticism. A true gem of a book with a brilliant job of world-building by Funke. Ok. You’d think after visiting this site daily for a two or three years, I’d have read today’s wonderful book by now. I finally have it ordered from the library. I promise. Gordon — we all miss one from time to time. I’m just glad I got to introduce you to this book. I love this book and all it has to say about the importance of reading and the joy of it. Can’t wait for the grandkids to get a little older so I can share it with them!